We, "Skipper Technologies India Private Limited” is prominent firm instrumental in supplying, distributing and exporting much demanded range of Survey Instruments since 2012. we provide excellent quality Electronic Total Station, GNSS Receiver and Robotic Total Station. We have repute for being an innovatively excelled firm by offering top-notch solutions and services which are rendered specifically as per precise needs of market. Our offered survey instruments are widely accepted for their long life functionality with excellent accuracy in performance. With their procurement being done from reckoned vendor, we are able to assorted demands of customers with full satisfaction. Keeping sync with latest market developments, we have implemented savant-grade infrastructure system. Our infrastructure system comprises of high-end warehousing and quality testing unit through which we are able to meet the diverse demands of customers. Moreover, we ensure the prolong functionality of the instruments by inspecting them with adamant approach as per latest quality parameters. With the prime objective of serving the precision measurement tool industry by bringing best in class products, we have tie ups with well-reputed vendors. In addition to this, we have at team of assiduous professionals who with extensive business ethics and knowledge of this domain have greeted us with vast customer base. We also provide reliable repairing services which are appreciated in the market for in-time completion with uttermost accuracy.We are authorised dealer of TOPCON Brand. Under the effectual guidance of General Manager Mr. Sandeep Agarwal, we have witnessed transcendence growth in this domain. With his wide adeptness and non-deviating focus on quality, we have earned ourselves respectable clientele network to serve. We are one of the foremost organizations engaged in supplying wide assortment of superior class Survey Instruments. With the prime objective of serving the industry with reliable and maintenance-free instruments, we procure our products from the well-reckoned vendors. Moreover, with the assured quality, we also provide these products in tamper-proof packaging under minimum delivery time frame. We have a well established service center outfitted with all required tools and devices need to repair our products. Our instruments work efficiently to catch the faults and offer the best solutions. This department is handled by our well-trained professionals possess rich experience in their domain. In order to move with the fast pace of this occupation, we regularly conduct seminars to our team about new technological advancements taking place in the market as well as update our tools and devices. Our highly adept supported team of personnel put in all efforts, to achieve number of the set goals. The team has been departmentalized into various operational units, for executing different function in smooth way. The division of our team is carried out while considering their work skills in an area of expertise. In addition to this, regular trainings are offered for keeping them updated with latest industrial norms. 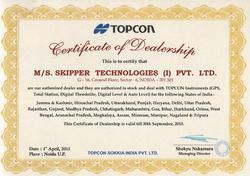 Skipper is the authorized Service Center to repair all kinds of TOPCON Surveying Instruments. The Service Center is set-up as per Topcon guidelines and equipped with all the Special Tools and Jigs imported from Topcon Corporation, Japan. The instruments are checked and calibrated with Universal-4 Collimator which is self adjusted collimation system and therefore, all the adjustments are free from human error. The Diodes of the Distomats are aligned with a CCD Device attached to the powerful Telescope. This service center is managed with highly technical qualified Engineers trained from Topcon Training Center, Singapore. 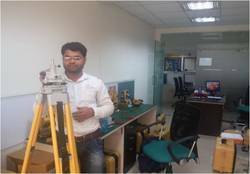 Skipper has established its Surveying Instruments Division in Noida with a state-of-the-art Service Center fully equipped to cater to all complex needs of these highly sensitive equipments and to handle sales and service needs of our customers. Our Service Center in Noida has been built on the Philosophy of "Center for Competence" for providing service to our customers. We are always updated on the latest test equipment in our service laboratory, as well as hold sufficient stock of spare parts to provide the fastest response to our customers. We as a policy have made "Service in Time" our motto. Our strict adherence with employing quality in all our operations has positioned us as a valued firm among our clients. With the advantage of our highly advanced quality testing unit, we are able to ensure the effectiveness of our products. We utilized team of skilled quality controllers for checking of these products under strict quality parameters. With this approach, we are able to serve our clients with maximum gratification.